The ease and genuine happiness that Linsey and Nicky felt on their wedding day, effortlessly depicted by Amy Ann Photography, makes our hearts smile. 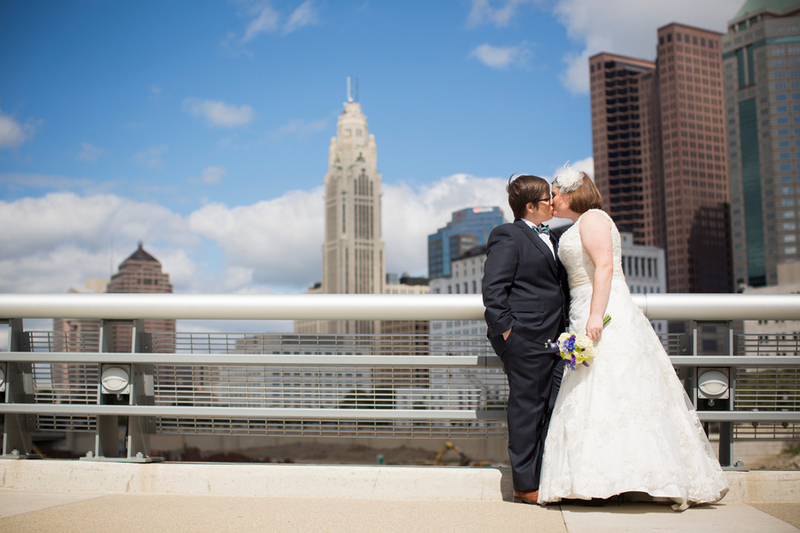 Our California gals returned to their roots in Columbus, Ohio for their big day, joyously celebrated on a sunny Saturday in mid-September. Taking advantage of the landmarks Columbus has to offer for their wedding photos (and so they could maximize their time together), Linsey and Nicky enjoyed macaroons at Pistacia Vera, gushed in front of a fountain at Bicentennial Park and took in the picturesque Columbus skyline — all before they stood before their loved ones and vowed to one another that they would always ask before bringing home another furry baby. Nicky likes to say that Linsey just showed up on her doorstep because that’s literally how they first met! “We actually owe it all to our mutual friend, Sarah, for convincing me to get out of D.C. for the day and spend a night out in Baltimore to hang out with her friend, Nicky, who had just moved there,” says Linsey. They spent the rest of the night talking, learning about one another’s common interests and that they had, in fact, visited many places at the same time but had never crossed paths until now. A week later, it was time for the big night … the first date! Linsey and Nicky watched an Ohio State football game together at a local bar in D.C., spending the rest of the evening walking, talking and enjoying pizza in Dupont Circle. Two days later, while strolling along the Potomac River, Linsey asked Nicky to officially be her girlfriend and within three months they were in love. Despite the trials and tribulations that the following two years of long distance would bring, the soul mates persevered. After Nicky got a teaching job two years later in Los Angeles, Linsey eventually followed her true love to the West Coast, and since then, they haven’t looked back. However, the best part about Linsey and Nicky’s ensembles was the perfect way in which they personalized them with sentimental accessories. 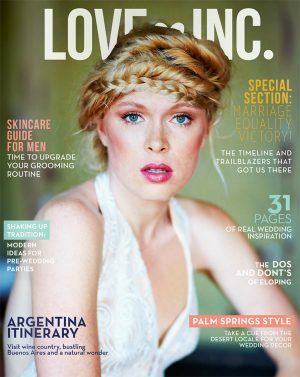 Linsey wore a bow tie from Jesse Tyler Ferguson’s Tie the Knot collection, designed by WNBA star Brittney Griner, along with cufflinks inscribed with each of their initials. Nicky hunted down the perfect hairpiece that added a bit of elegance to her outfit and was adorned with Linsey’s pearls. 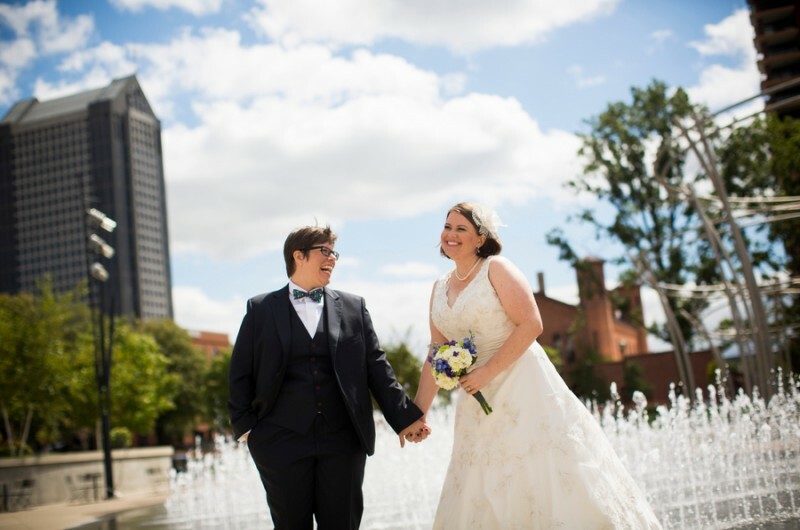 If planning a wedding wasn’t already stressful enough under normal circumstances, just try doing it remotely like our lovebirds here, who planned their Ohio wedding from California. “There was definitely a Pinterest board or two dedicated to flower design and many an e-mail back and forth discussing the intricacies,” the happy couple tells us. Families joined forces to create the perfect floral design, Nicky’s sister and Linsey’s mother teaming up to create wooden boxes with mason jars full of blue and white hydrangeas, purple statice, white larkspur and lavender. Linsey and Nicky worked with the budget they had to make their special day all their own, complete with all of their favorite people in the world, Hillary Clinton-quote napkins, delicious cupcakes, a DIY photo booth, a s’mores station and undeniable happiness in every moment. Linsey and Nicky provided a delectable vegetarian buffet from Whole Foods for their guests, creating a mouthwatering menu of kale salad, grilled ratatouille, quinoa stuffed bell peppers and spaghetti squash nests. The couple had a blast tearing it up on the dance floor to their iPad DJ and Spotify playlist, sharing their first dance to Janelle Monet’s “Prime Time,” which was the first concert they ever went to together. The DIY photo booth brought on the craziness, constructed from an iPhone, remote and of course, lots of wacky accessories. “After cutting the cake, Nicky and I slipped out the side door with a piece of cake and went and sat under the trees on a picnic bench. We wanted to check in with each other and see how one another were handling the big day. I remember looking into her eyes and feeling completely mesmerized that I not only was lucky enough to find my wife, but that our wedding was such a blessing. We were surrounded by family and friends, had gorgeous weather and everything was picture perfect.